The U.S. agriculture sector is caught in the crosshairs of a geopolitical trade war. Farmers are facing mounting uncertainty with limited options. China imports the majority of its soy from the U.S. It uses it for food and as feed for its prolific pork industry. The 25% duty on American-produced soy will hurt U.S. farmers. Brazil and other South American countries are now slated to supply China’s demand for soy. China is also looking into replacing soy with other crops. That could see long-term demand for American soy fall even if the trade war ends. Washington, D.C. is making amends with farmers through a $12 billion relief fund. That’s to make up for the $12.3 billion in soy that China bought from the U.S. last year. But farmers are unlikely to want to rely on this aid in future years. Instead, many will shift to growing corn. Early estimates showed shrinking supplies of corn. That may no longer be the case for next year. If trade tensions continue, it is likely that farmers will ditch soy for corn. 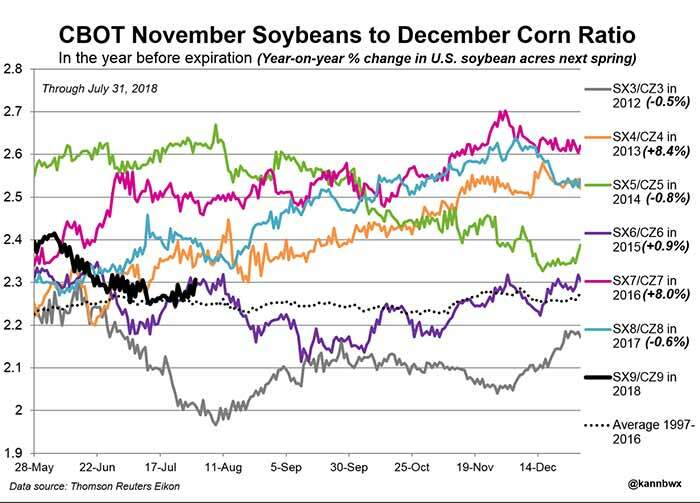 The chart below shows the ratio of corn to soy futures prices for 2019. A ratio of 2.5 or higher usually favors soy planting. The current ratio (the black line) is at 2.3, suggesting that corn is the favored crop. Corn may not end up being the savior that farmers are looking for, though. An oversupply of corn next year would send prices plummeting. Some farmers will diversify into wheat to hedge against this risk. Acreage dedicated to wheat is at historic lows. The list of items China slapped tariffs on is growing. With agriculture and energy in the mix, China is signaling that it is committed to standing its ground. As the trade war wears on, there will be few winners to emerge.